Your Big Good for the game, and dresses the part. In many western and European societies, the colors gold and white are associated with goodness and divinity. White and gold invoke images of Heaven and angels, and embody purity and incorruptibility. White shines brighter than any other light, and in modern times we know it to be a pure combination of all other shades, while gold never tarnishes, rusts or corrodes, is associated with the sun, and of course is one of the most valuable minerals on Earth, especially in ancient times. The color white is also associated with the other big precious metal, silver. Thus in works of media, you're likely to see divine beings clad in white and gold. As white and gold can represent the sky as part of their association with Heaven, blue may also be featured. The deities may be associated with the colors beyond clothing, and thus have silver/white or golden hair, with pale or bronze skin. Even with gods that are not good, the colors still reflect their divinity. The colors may also feature on their relics. Mortals who are connected to the gods, or wish to appear as divine figures, will also wear white and gold. A Sub-Trope of Good Colors, Evil Colors and Color-Coded for Your Convenience. Compare Color-Coded Patrician, Light Is Good, Light Is Not Good, Woman in White, Man in White, Gold-Colored Superiority, Golden Super Mode, Supernatural Is Purple, Heavenly Blue. Contrast Red and Black and Evil All Over, Evil Wears Black. Digimon, numerous Angel Digimon are colored white, gold and blue. Angemon and Angewomon are probably the most famous. In Saint Beast, the head god Zeus wears a white chiton with gold accessories while the angels dress in a variety of colours in comparison. The Gold Saints in Saint Seiya. Divine? Definitely. Good? Well, not all of them. In Ah! My Goddess, the signature colors of Belldandy's goddess "uniforms" are blue, white and gold. As depicted in The Movie, the Heavens consist of futuristic white marble buildings with gold trim and lots of trees throughout. In Saiyuki, Genjyo Sanzo has golden hair and dresses in white, as did his mentor Koumyou Sanzo, and his previous incarnation Konzen Douji. None of them are exactly traditional in their divinity, but a Sanzo priest is the highest rank there is, and Konzen was a minor noble in Heaven. Knight Carim Gracia of Lyrical Nanoha. High Priestess of the Saint Church with a magic color of gold. Blue Exorcist's Arthur Auguste Angel, the current Paladin of the True Cross Order, dresses in white and has blond hair... and is probably one of the most jerkiest characters in the series. In Kamigami No Asobi, a Crossover Cosmology "reverse" harem series, Apollon and Balder both have white and gold costumes in their god forms. It fits them, as the God of the Sun and God of Light, respectively, but it isn't true across the board. Dionysus, God of Wine, has a purple costume; Susano'o, God of the Sea, has a blue costume, Hades and Anubis, Gods of the Underworld, have black costumes, etc. But their school uniforms are mostly white and gold - not that all of them wear the right uniform (Susano'o and Loki wear mostly-black athletic jackets). Puella Magi Madoka Magica: Madoka's Magical Girl forms have always had a white motif, but becoming a goddess lands her a pair of Supernatural Gold Eyes on top of it. As the daughter of Queen Serenity (who was known as Selene on Earth) and her own personal power, Usagi has definitely this in both of her 'Serenity' forms. Sailor Venus is the only one of the Sailor Senshi to be regularly called a goddess (specifically, she's been alternatively referred as the Goddess of Love and War), and is notable for wearing a mostly white outfit while being blonde and and carrying golden weapons. In Cute High Earth Defense Club LOVE!, the Student Council, who wear white and gold Custom Uniforms, play with this. They not only view themselves as a rarefied elite, but seem to be viewed in the same way by most of the students. When they transform into their Magical Boy forms, they become Evil Wears Black. While the rest of the field is shrouded in darkness, the victory of the small, but just David over the towering villain Goliath is framed against a white and gold tent. This is in a tradition of associating David's victory with the divine victory of Christ over sin, something Michelangelo knows from his most famous sculpture, David. The two keys to the kingdom of Heaven, both in Perugino's Delivery of the Keys and Michelangelo's The Last Judgement, are respectively gold and silver to represent their power from Heaven and their authority on Earth. In the Big Finish Doctor Who audio Paradise 5, Paradise 5 is a holiday resort space station with a heavenly theme (and, this being Doctor Who, a Dark Secret). The uniforms, fixtures and fittings are all done up in immaculate white with gold highlights, at least "front of house". The Phoenix in X-Men. Normally green and yellow (same colors as Jean Grey's outfit immediately prior to becoming Phoenix, in the comics), turning red when she becomes Dark Phoenix. However, the most perfect melding of Phoenix Force and host is the "White Phoenix of the crown," in which the suit becomes white and gold. We've seen this form on extremely rare occasion, at least, until after her permanent bonding with the Phoenix, when this becomes her default form. For the first time in decades, Iron Fist switched the colours of his suit towards the end of the first arc of New Avengers Vol 2. At time of writing, his costume is gold and white, rather than the green and yellow that it usually is. Note that this wasn't entirely explained in-universe. The White Martians in Warlord of Mars consider themselves as divine beings, intermediaries between their goddess Issus and the other Martian people and are associated with these colors, but in reality, neither of them are divine. They're also worn by Lily Potter as the White Phoenix of the Crown. In RainbowDoubleDash's Lunaverse, gold and to a lesser extent white are the colors associated with Corona, and are hence all but universally rejected. In TRON: Endgame Scenario , Benevolent A.I. Ma3a is described as having gold and white robes and a gold mask covering her face. Fitting as she's something of The High Queen of the Encom system and even more fitting, as she's technically Lora Baines-Bradley, a human trapped in the system, and technically a Physical God over the Programs. The Heralds of Dawn and their apprentice Coera in Re:Flection Scenario all wear white outfits trimmed with gold, including Souzi's 24-Hour Armor. "Holiness" is an important motif of their's, and it establishes them as visual foils to other villains like Organization XIII. Latius from Kaleidoscope has blond hair and wears a white costume. His namesake is Zeus, the top god of Classical Mythology, and his costume is patterned after Yuri!!! on Ices Agape costume. unconditional love. Like Gods love. When the group of heroes meet up with Zeus at the end of Hellsister Trilogy's first story arc, he is wearing white robes and sitting on a golden throne. In Through Darkness And Mirrors, Elena's "White Rabbit" attire in Act 5 has her in a white flowing dress with golden trim and two golden "rabbit ears" perched on her head. In The Princess and the Frog, Mama Odie wears a white dress with gold jewelry , and her home and song sequence use a lot of golden light. Word of God says that the gold was chosen for her because it's one of the Mardi Gras colors (with the others, green and purple, being used for the main couple and Big Bad, respectively). Roy Batty in Blade Runner. In his final scene and the film's climax, he gives an enlightened monologue and is established as a divine, pure being - despite being a replicant - because of his understanding of the world. Whilst he gives it, he is bathed in very bright, white light. The gods featured in the 2010 Clash of the Titans, especially Zeus's sparkly getup. In Guardians of the Galaxy Vol. 2 the Sovereign are a race of gold-colored people, who consider themselves superior to everyone else. In one scene they make a grand entrance in a winter planet, wearing gold capes with white fur. But it turns into a Failed Attempt at Drama. Florence Fallon, in The Miracle Woman, wears white to invoke this trope, and make others believe that she's a saintly person. She's anything but. They were pressing about one bound to a pillar: a slender white-skinned youth, with a cluster of golden curls about his alabaster brow. His beauty was not altogether human—like the dream of a god, chiseled out of living marble. In Dante's The Divine Comedy, a griffin is identified with Jesus by its gold and white coloring. The eagle's skyward facing wings are gold to represent Christ's kingship as God, while his white body touching the Earth represents Jesus of Nazareth's Incorruptible Pure Pureness as a sinless man. Mentioned in Raymond E. Feist's Riftwar Saga. In Tsurani culture the Emperor (known as the Light of Heaven) has White and Gold as his house colours. Expanded on in the Empire trilogy co-written with Janny Wurts. Ashen-Shugar is a being of divine power, but in his case this is not an indication of his morality. A member of an Above Good and Evil Proud Warrior Race, who only gained traits beyond bloodlust and greed after a Mind Meld with a human. And even then his more positive traits are an extension of his greed - he will fight to protect what he sees as his because nobody else is allowed to have it. In The Satanic Verses, after Ayesha of Titlipur receives a revelation from the Archangel Gibreel (Gabriel), her hair changes colour to white flecked with gold, and she is surrounded at all times by golden butterflies. Ultimately though she serves as an example of Light Is Not Good, as she increasingly veers towards ruthless and insane fundamentalism. Darken Rahl, the Big Bad from the first book of The Sword of Truth series, was wearing white with a narrow band of gold, and a knife in a golden scabbard. He was worshiped like a god, tried to obtain godlike powers through an ancient artifact, and served the devil. In L. Jagi Lamplighter's The Unexpected Enlightenment of Rachel Griffin, the colors of the Eternal Flame, tended by Vestal Virgins and harming only the wicked. In the Worm universe, Scion, the first superhero, is a golden figure wearing a white jumpsuit. We later learn that 'he' is actually an extraterrestrial interdimensional alien who took that form to invoke the trope. Played with in The Stormlight Archive; of the three Shards that serve as Roshar's gods, the one who uses these colors as his motif is... Odium, the Big Bad, resulting in a serious case of Light Is Not Good (though Odium's appearance and demeanor seem calculated to invoke classic Grandpa God imagery to put the people he's manipulating more at ease). Of the other two Shards on Roshar, Honor favors blue and Cultivation prefers green in their motifs. Played with in the Fallen series by Lauren Kate. Fallen angels that since their fall have chosen Throne have wings tinged with silver, the ones that have sided with Lucifer have wings tinged with gold and only the ones that remained without allegiance have wings that are purely white. In Angel the local direct agents of The Powers That Be were at one point represented by gold-fleshed humanoids in white togas. Played straight with Chuck, who is confirmed to be THE God by...well, Word of God and wears a pristine white suit in his most important appearance. The mysterious figure named "Lord of Lord and King of Kings" (Revelation 19:15-16) along with the angels in the Book of Revelation are also dressed in white. Some interprets the figure as Jesus himself after his Second Coming. From Warhammer 40,000, the man known only as The Emperor of Mankind plays with this trope and its implications in many ways. Back in his days among the living, the Emperor wore an ornate suit of golden power armor, and many parts of the Imperium of Man took the same aesthetic. He was so powerful that he even glowed gold, artwork often depicting it as a halo; though when he needed to make an impression, he was known to turn it up bright enough to permanently blind certain populations. As for how this trope was Zig-Zagged, he certainly used his look and aura to invoke an air of majesty and power. However, it warped into a holy motif much against his wishes. Also, the Emperor was a coldly pragmatic and ruthless man, utterly dedicated to preserving humanity at any cost; and for all of his knowledge, power, and experience, he was still fallible, at times tragically so. With humanity's ultimate fate at stake, he couldn't be concerned with ethics and morals or his own sense of humanity, and he firmly straddled the line between The Messiah and Dark Messiah. Eventually, the Emperor was struck down during a civil war and interred on the Golden Throne, a mysterious device retrofitted into a life support machine. Among other very important things, the throne artificially keeps him alive, and should it fail, the Imperium would effectively end in multiple, simultaneous ways. Though the good news is that his soul is exercising its power to support the Imperium wherever and however it can, effectively becoming the deity of the Imperium. Having become the God-Emperor of Mankind, he's now the silent, nominal leader of a bloody empire that's still humanity's best hope in a galaxy trying to snuff them out. Many Fairy-type and Light-attribute monsters in Yu-Gi-Oh!, including high-ranking Fairies The Splendid Venus ◊, Athena ◊, Tethys Goddess of Light ◊, and the Airknight Parshath ◊ line. The "Lightray ◊" archetype is designed around the idea of Good Counterparts of existing monsters (an earlier archetype featured Evil Counterparts), and their outfits are recolored white, gold and blue. The "Lightsworns ◊" also feature white armor with gold details. in Dungeons & Dragons, yellow, gold, and white are the favored colors of Pelor, the most generically good of the various good-aligned gods. The Unconquered Sun and his chosen Solar heroes in Exalted tend to radiate a lot of Glorious Golden Power. That said, this game subverts almost all of the preconceptions of a standard fantasy world, so expect plenty of Light Is Not Good, Good Is Not Nice, Good Is Not Soft, and other such tropes in play. Also, there's much more variation in the coloring; Solar auras include not just gold and white, but also the reds and violets of sunrise and sunset. In Magic: The Gathering, Angels, humanoid manifestations of (normally white) mana, tend to favor gold and white clothing. Angels with different mana alignment tend to have more varied outfits. In Halt Evil Doer!, the local Superman-expy is Divinos, who has a gold-and-white costume and a bit of an angelic theme. Cirque du Soleil has used this a few times. Nouvelle Experience and Alegría both have sets of characters known as "Angels"; each set wears gold-and-white outfits. Another character in Alegria, the friendly, clownish Tamir, also wears gold and white; his sinister Foil Fleur is Red and Black and Evil All Over. In Dralion, the Ame-Force singers (representations of harmony) dress in white for Act One and gold for Act Two. The Little Buddha, who will eventually become an Ame-Force, is always dressed in gold. In BIONICLE Takanuva, Toa of Light, wears white and gold armor. Subverted with the Matoran tribe of Light; they too have natural white-and-gold armor but can use their power over light to change how it appears, making it look any color but white and gold. Later on, Mata Nui would provide the most literal version of this trope in the series: he has entirely gold and white armor in The Legend Reborn's novelization. In all other depictions, though, he partially averts it by having gold and black armor. Averted by Irnakk, a figure from Skadi folklore. His golden head and spine are his most recognizable features, but he's essentially the Devil of their mythology, to the point that the Piraka Hakann went into a panic attack when he realized the monster that was coming towards him had the same colors as a being from myth. Pit in Kid Icarus: Uprising. He's an angel who defends the heavens with a magic bow, dressed in a white tunic with gold bracelets and a golden wreath crown in his hair. Also from the same game is Palutena, the Goddess of Light. While her hair is a deep green, she wears a white robe adorned with gold trimmings, and has on lots of gold jewelry, including a huge gold necklace. Angels and Lumen Sages generally in Bayonetta use predominantly white and gold color schemes. Doesn't stop them from being evil at times, though. 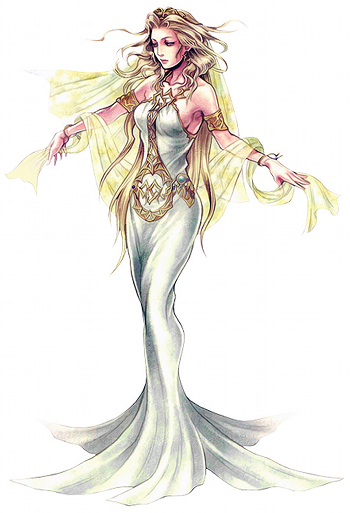 Page picture provided by Cosmos of Dissidia: Final Fantasy, the game's Big Good and Goddess of Harmony. In the same game her protector and leader of the heroes and all-around shining paragon of light, the Warrior of Light, wears primarily blue armor with khaki and white. 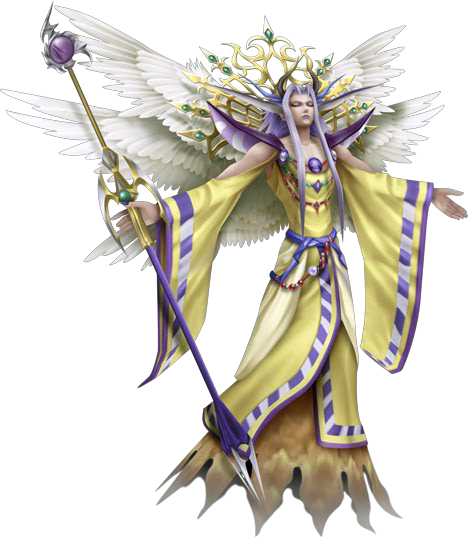 The "Light Emperor" ◊ of Final Fantasy II represents the "good half" of Big Bad Emperor Palamecia, rules over Heaven, and wears light yellow and gold robes with lavender and white details, a gold crest and white wings. Turns out he's no more good than his other half. Cecil of Final Fantasy IV has, Depending on the Artist, gold, white and blue armor as a Paladin. Final Fantasy XIII, Galenth Dysley wears a white robe with gold and blue colorings. His title in the Japanese version of the game is even "Great Pope", and so he looks the part. Zigzagged by his true form Barthandelus, which at first appears almost entirely black with sparse white and gold details, but lightens to silver and white with more prominent gold colorings in subsequent battles. In the same game, Orphan appears as a gold and white being. Hope wears the same colors in Final Fantasy XIII-2, probably as a conscious decision by the character designers to denote he serves a similar role in society. Several Final Fantasy games set in Ivalice feature Ultima the High Seraph, with blue-green skin and robes of white and gold. Manaketes of the Divine Dragon tribe are either white or gold in their dragon forms. some of them are: Gotoh, Naga, Tiki, Xane, Mila, Duma, Fae, Idoun, a Female!Morgan mothered by Tiki, etc. It's not confirmed whether Nowi and Nah belong here too, but the fandom assumes they do. The royal family of the herons have long gold hair, white wings and dress exclusively in white and gold. They are compared to and framed as angels more than once. The tribe has been said to be closer to the goddess than others. A more subtle example in the same setting, Micaiah's combination of silver hair and gold eyes are a sign of her ability to wake the goddesses and act as the vessel for one of them. Queen Mikoto from Fire Emblem Fates has a special customized Priestess sprite with a gold and white color scheme (and if Sakura promotes into Priestess, she'll have a similar one). Likewise, Duke Izana has white-blond hair and a golden hair clip, and has the ability to directly talk to the Gods. The prince and princess of Fire Emblem Heroes dress this way, and they are able to summon a hero who can summon all the heroes from all the games; making their world a Portal Crossroad World. Likewise, it would appear that the prince and princess in Fire Emblem Warriors are similar. Ultima: The Avatar, a near-Physical God by the end of the series, is commonly shown in white and silver armor with a gold ankh on the chest and blonde hair. God of War, Zeus wears a white robe with gold armor. Helios is an interesting case in that he wears normally a golden armour complimented by a white toga, but he has a crimson cape as well. Arceus. It is mostly white with what appears to be a gold wheel around its mid-section and gold hooves. However, depending on the plate it is holding, the gold parts change color to match the color of the plate and the typing. The Aether Foundaton from Pokémon Sun and Moon exist to protect and preserve Pokémon, especially those stolen by the villainous Team Skull, and to study the dire threat posed by the Ultra Beasts. Aether Paradise serves as a preserve for particularly endangered Pokémon. They're also completely nuts, with their president serving as the game's Big Bad. Ultra Necrozma, which appeared as a golden angelic dragon, particularly fits the 'divine part': Before it became the light-eating prism monster that it is now, Necrozma was a benevolent deity-like being. Most angels of the Disgaea series. Breath of Fire III and IV, Ryu ends up with blonde hair and white-clothing whenever he transforms into his "final" form (Kaiser in III and God-Ryu in IV, respectively). Fou-Lu also counts if he absorbs Ryu in the non-canonical ending. Also, Infinity in IV, Fou-Lu's transformation if he absorbs Ryu, is a palette-swap of Tyrant Dragon, with white and gold skin, and blue divine wings. Fina's dress in Skies of Arcadia. In the Monster Rancher series, the Gali is an invisible creature represented by a gold mask and white cape, with high intelligence and mild temperament, and the flavor text suggests it to be an actual divine being. All monsters with the Gali subtype gain its coloring and personality traits, making the Gali a good mix for monsters that are normally stubborn and harder to train. Shinkoku officials abuse this trope (along with some silver) in Asura's Wrath. They set themselves up as immortal cyborg demigod saviors, but in reality they are exploiting the people for their Mantra. The Tower of the Gods from The Legend of Zelda: The Wind Waker is mostly white stone with gold accents, and it marks the start of that color scheme for similar future dungeons and outfits. In The Legend of Zelda: Twilight Princess, the Temple of Time has a nearly identical color scheme to the one for the Tower of the Gods. The City in the Sky has this color scheme as well; both it and the Temple of Time were created by the Oocca. In The Legend of Zelda: Skyward Sword, Zelda dresses like this after falling to the surface, indicating that she's an incarnation of the goddess Hylia. In The Legend of Zelda: Breath of the Wild, Zelda has a similar dress that she wears when praying at sacred springs. Her formal dress and Adventurer Archaeologist outfits have some white and gold trimmings, though they're still predominantly blue. The Big Bad of the Onimusha series is the God of Light, Fortinbras. As such he always appears in gold, silver or white colors. His divinity is unquestioned, but his goodness is certainly non-existent. Notably, that's actually a Taoist Prester Zuul, hence the yin-yang symbols on his helmet and those of his female retinue — Catholicism was a big enough influence on the early Prester Zuul that even those who don't follow it tend to adopt some of its trappings. In Tales of Symphonia, Yggdrasill has long, golden hair and dresses in a white bodysuit with gold decorations. He's the leader of Cruxis, the game's organization of angels. He's also the Big Bad. In Darksiders, this is the color scheme of most of the angels and their angelic gryphon mount that the protagonist steals from them. The Holy Light of World of Warcraft is associated with this, and its paladins and priests (e.g. Tirion Fordring and the Prophet Velen) are often seen in said colors (Heavenly Blue is a common tertiary color, but purple (especially among draenei) and red (especially among blood elves and the Scarlet Crusade) also occur somewhat frequently). Sirius, your one ally for most of Bomberman 64, wears white and gold armor, and he completes the angelic look by housing his rockets in a set of mechanical wings. It turns out he wants the Omni Cube for himself to gain godlike powers for real. Zig-Zagged by the White-Gold Tower on the Imperial City Isle in central Cyrodiil. How it plays this trope depends on the time period in question and the in-universe point of view. One of eight metaphysical "Towers'' constructed by the ancient races of Mer (Elves) in emulation of the Adamantine Tower (itself constructed by the surviving Aedra to hold "convention" after creating the mortal world), the White-Gold tower was constructed by the Ayleids ("Wild Elves") of Cyrodiil using the "Chim-el-Adabal" (said to have been created from the crystallized blood of Lorkhan, collected as it traveled across Tamriel to its resting place in Morrowind) as their "Stone". Following the Alessian Revolt (a revolt of their human slaves), the tower would be taken by the Nedes (ancestors to most of the modern races of Men in Tamriel). After capturing the Tower, Alessia, leader of the Nedes, would forge a pact with Akatosh, the Top God of the Aedra and Dragon God of Time. Akatosh gave to Alessia and her descendants the Amulet of Kings (whose centerpiece was the Chim-el Adabal), as well as the Dragonfires of the Imperial City. So long as the Empire maintained its worship of Akatosh and his kin, and so long as Alessia's heirs bore the Amulet of Kings, Akatosh and his divine kin would maintain a strong barrier protecting Mundus. The White-Gold Tower itself would serve as the Imperial Palace of all the various Cyrodiilic Empires in Tamriellic history. Though not without its flaws, the Cyrodiilic Empires have generally been rather liberal and well-meaning (though don't get most of the races of Mer talking about them...). This, of course, came to an end during the Oblivion Crisis when Martin Septim, last in Alessia's metaphysical line, shattered the Amulet of Kings and sacrificed himself to end the Crisis. The White-Gold Tower itself still serves as the palace of the Mede Dynasty, which holds together the last vestiges of Septim Empire before it. In Skyrim, the driving force behind the Civil War between the Imperial-supporters and the secessionist Stormcloaks is the White-Gold Concordat, the name given to the peace treaty that was forged between the Imperials and the Thalmor, which, as part of the agreement, stipulates that the Imperials needed to outlaw the worship of Talos. The Thalmor do consider themselves to be a superior, divine race, charged with the extinction of every other race, be they human, elf or beast. The High Heavens of the Diablo universe primarily have a gold-and-white motif, and many angels have a gold-and-white motif to their armor or weapons. Xenoblade has the god of the Bionis, Zanza, who wears a predominantly white-and-gold outfit for a good extent of their appearance within the game as befitting their status. That said, he may be divine enough for the color scheme, but he's not benevolent at all; in fact, he's the Big Bad. Kaileena of the Prince of Persia: The Sands of Time trilogy. By the beginning of The Two Thrones, she has ditched her Lady in Red look from Warrior Within and gone for a more Stripperific gold-and-white attire, ◊ giving away the hint that she is the Empress of Time, whose body is turned into the Sands of Time upon getting killed. Invoked by the long-fallen Orokin Empire, who loved to use white and gold in combination with artistic designs for just about everything, creating an angelic image. At the height of their power they controlled the entire solar system and have created technological marvels. One of the present day factions in the game even sees their technology as divine and worships it. However, after we learn more about the Orokin, this is a good indicator of their vanity rather than good nature, since they were hideously abusive towards the rest of humanity. Also many of the prime versions of warframes are artifacts (or reproductions thereof) that date back to the Orokin, and have the same white and gold color scheme as the default. The white is not as common in the primes that were released later, but all have the gold trim. The Protoss of Starcraft achieve this effect by being naturally pale and wearing golden armor (except the Dark Templar). Taken even further in the sequel, where their combined forces are known as the Golden armada. Gwynevere, Princess of Sunlight from Dark Souls appears as giant, beautiful woman with bronze skin, clad in elegant (if revealing) white clothing trimmed in gold. Rather this is what she actually looks like, or is an idealized version her shaped through Gwyndolin's illusion is subject to debate. While Mercy from Overwatch is not technically a deity, she does have an angelic theme and serves as a healer. The Downloadable content from Injustice 2 contains the God and Demon shading for all characters. The God Shading changes the characters' outfits to be a combination of white and gold, as well as shining white eyes. On the flipside, the Demon Shading gives them black and red outfits, as well as Black Eyes OF Evil. fine of Ensemble Stars! usually wear white outfits with gold accents and have a heavenly, angelic theme, reflecting both their image as a good and pure idol unit (despite the reality being very different), as well as their enormous level of power. An angel in a demon-infested site is white and yellow. Ahriman, God of Knowledge, speaks in yellow and white speech bubbles. Girl Genius: Agatha, Martellus and Zola exploit this trope with their costumes for the masquerade in Paris. In Our Little Adventure, Angelo poses as this down to glowing yellow eyes when angered. In The Order of the Stick, Elan's Good Angel is blue faced, white bodied, and golden winged. So, apparently is Belkar's, though we can't see the white body. The celestial tree sloth is white (with blue accents) and has a gold halo. In The Adventures of Shan Shan, the winged lion is yellow with white wings. In Rusty and Co., Madeline's "power of the gods to heal" — a white beam inside a golden glow. In Overcompensating, God wears a white robe with golden letters spelling out "YHWH". Jesus wears a similar attire that says "INRI", though often the color of his robe is more beige or light brown. The colors gold, white, and red are associated with the God of Time in Tasakeru. Likewise with silver, white, and blue for the Goddess of Life. In My Little Pony: Friendship Is Magic, Big Good Physical God Princess Celestia's coatnote Not a coat in the sense of a piece of clothing. We're talking about ponies, remember. is white, and her crown, breastplate and shoes are gold. Averted with her sister, Princess Luna, who is blue and black. Their color schemes are supposed to represent day and night, respectively. The Daughter from Star Wars: The Clone Wars is the embodiment of the Light side of the Force, and she wears a white dress, with golden shoulder and neck. Amon from The Legend of Korra wears a mask that is primarily white and gold (with a red dot in the forehead). He presents himself as a Messianic Archetype, though the colors of his mask should generally be read with a healthy sense of irony. This trope can be traced back to the ancient statues of gods which were covered with ivory and gold, such as the statue of Zeus at Olympia, one of the Seven Wonders of the World. This was so common that there is a term, "chryselephantine", used solely to refer to such statuary. Apollo's weapons are referred as silver or gold interchangeably. Most swans have mainly white bodies with golden head and nape feathers (best seen in mute and trumpeter swans). That added to their divine reputation, and connected them further to sun gods. The clothing of many gods from Egyptian Mythology is white with gold trim, particularly the ones that wear kilts like Anubis. Gold itself was considered the skin of the gods in ancient Egypt. Pharoh death masks were made of the stuff to symbolize the formerly mortal king joining the ranks of godhood. The Pope, of course, and numerous symbols of Christianity, including the Keys to Heaven, a gold and a silver key overlaid. The Catholic Church invokes this trope at Christmas. The flags and arms of the Kingdom of Jerusalemnote No longer a thing, but someone out there is keeping the title alive and Vatican Citynote Where The Pope lives. Contrary to what many say, the Papal States did not use the gold-and-white design for most of its history; rather, they used a red-and-gold square vertical bicolor, a traditional symbol of the city of Rome. The gold-white flag was adopted in 1808. are the only ones allowed to use gold and white/silver together—normally the rules of heraldry forbid putting two metal colours together—precisely because it is seen as exceptional and holy. Catholic churches in general like to fly white and yellow flag, and in Germany road signs noting the hours of worship in a nearby Catholic church show a stylized yellow church on white. There were and are a few other places using yellow and white flags, e. g. the duchy (later kingdom and Prussian province) of Hanover (yellow over white, still used today in those parts of Lower Saxony that used to belong to Hanover) and the Prussian province of Silesia (white over yellow). LaVeyan Satanism has adopted black and silver as its colors precisely because it's more or less the inversion of this trope. Though people specialising in Solrath and/or Moloch tend to use black and gold. And some use white anyway.